The next day a large boulder slid in on my partner and pinned his leg to the bedrock. He was just barely able to pry himself free, leaving his boot and the suction hose pinned under the boulder and his dredge in midstream. He swam to the bank. The first thing I saw when I surfaced at the end of my dive on my reserve air when the fuel tank on my dredge went dry was my partner’s dredge, floating in midstream with a dead engine. The emotional feeling caused by that vision I do not ever want to experience again. My panicked search for the shore for — what? What was I to do? How long had his dredge been floating there with a dead engine? And then I sighted my partner lying there on the bank with one booted and one bare foot, the ecstasy of happy relief! All the while I had been happily dredging away, totally unaware of the drama taking place six feet away. Oh yeah, the engine on his dredge quit for lack of fuel less than five minutes after he reached shore. Close! He lost three days’ work while the swelling on his foot went down. It took us both nearly a full day, working with six-foot crowbars to recover his boot and the suction hose from under the boulder. The hose was flattened to about an inch thick. Take your time, be careful and enjoy yourself. Good grief! There are thousands of easier and more comfortable ways of making a living. If you enjoy this activity, why not do it in an enjoyable manner so that you can continue to enjoy it? But, even when you are taking your time and you are thoroughly enjoying yourself and are doing everything as right as you can do it, for sure, The Law can still get you! Well, darn. Where is that stupid regulator (right-hand is now firmly grasping the weight belt buckle)? There it is! There’s a yellow line leading right into the suction nozzle! Well, I was able to extract it undamaged from the suction nozzle and clear it with nearly the last bit of air in my lungs. After resting a spell behind the rock, I went on to put that new dredge through its paces, uneventfully. Had that experience happened to me early in the season, when I was a rank beginner, for sure it would have been a horrible, traumatic affair. At the time I found it to be a bit funny and certainly embarrassing. Get experience. Practice. Gain confidence. Do it in easy places to dredge, in quieter water close to shore. 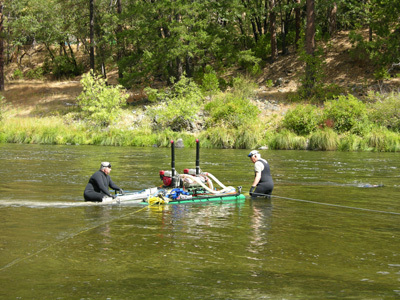 One of the larger nuggets gotten out of the Klamath this season was dredged up a foot off-shore in two feet of quiet water. 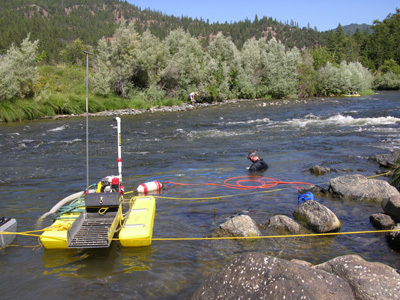 With an eight-inch dredge, true; but any first-time dredger with the very smallest of machines could have gotten it, while he was safely gaining valuable experience and confidence before tackling some of the more challenging stretches of the river. I think you’ll become as convinced as I am that Murphy was, indeed, a miner before he came to immortalize himself with his famous LAW. May all of YOUR experiences with his Law be funny, hilarious or at the worst, embarrassing-and do your darndest to stay out of its jurisdiction with wisdom, just plain smarts and anything else you figure might keep things going uneventfully and productively for you. Maybe a rabbit’s foot…. Your dredge will run out of fuel when you are moving a large boulder and your first indication of this is NO AIR. Your dredge will run out of fuel just as you are uncovering gold-laden bedrock, which will be covered with three feet of cobbles after you’ve re-fueled. Your dredge always has plenty of fuel left when you are freezing, starving or crosseyed from having to relieve yourself, and are seeking any excuse to end the dive. Dredges never nearly sink from cobble build-ups in the sluice box when you have a friend visiting your mining site. Dredges always run fine when you are removing barren overburden. Breakdowns will occur as soon as you uncover a rich, gold laden pay-streak. If you slip and fall and injure yourself, you will fall on something expensive and break it as well. If you slip and fall underwater with jam-rod in hand while wearing your weight belt, you will fall on your regulator and not be able to find it. It will begin raining furiously the night of the day you neglected to place your support gear six feet up the bank. If something you are not familiar with comes apart, some of the pieces will fall into the river — but you will not know which ones or how many. Anything placed on a boulder in the water will fall off. It will fall into the fast current, not the dead water on the shore-side. All wet-suits and dry-suits are made for Alien Beings. They are too large or too small, usually both and in the same suit in different places. Chances are, you will have gone broke before your custom-sized protective suit arrives. You will forget to zip up your dry-suit at least once in your diving career after a rest break. This, however, is such a shocking experience it is rarely forgotten. If you have steel-capped toes in your boots you will drop a boulder on your ankle. If you don’t have steel-tips of course it will drop on your toes. Dry-suits only cost three times a wetsuit, are twice as heavy, one-and-a-half times as buoyant, require only twice the effort to move around in because of the bulk, and are not dry because of your perspiration. They are extremely difficult to get into, nearly impossible to get out of and can be destroyed with one simple mishap of closing the zipper improperly. If there is anything sharp or pointed in the general vicinity of your dredge, your hole or access to same, it will puncture your suit. Suit punctures requiring immediate repairs only occur a few minutes before the first dive; never a few minutes before ending the last dive. Weight belts only come loose underwater when both of your hands are occupied. You never lose your weight belt until you’ve loaned your spare to a friend. Ditto on losing your face mask. There are many simple ways to coil a long rope, but no simple way to uncoil it. A length of rope left running free from your dredge or swing-line will snag on anything and everything; and, for certain, just right after you’ve put on your weight belt. Floating line is a terrible nuisance as it snags on everything on the river’s surface. Non-floating line is a terrible nuisance as it snags on everything below the river’s surface. The bow-line knot refutes Murphy’s Law. It is the only known thing in the universe that does. Rope, for a gold dredger, exemplifies another famous axiom: You can ‘t live with it and you can’t live without it! Clear a space to drop a boulder left, and it will roll right; and vice versa. Rocks too heavy to lift, and too small to winch, are usually covered with slime making them too slippery to roll, too. Some distinctive-colored and shaped nozzle-plugging-type cobbles can re-appear in your hole several times, after each time being frustratingly tossed out–until finally, you pick up the dinky thing and walk it 12 feet out of your hole, for good! Perhaps you have some axioms which have not been listed here?